A five-drachma-in-the-slot sacred water dispenser by Heron of Alexandria (10 -70 AD) was probably the world's first coin automat, and Vending Machines also ushered in the coin machine age, towards the end of the 19th century. 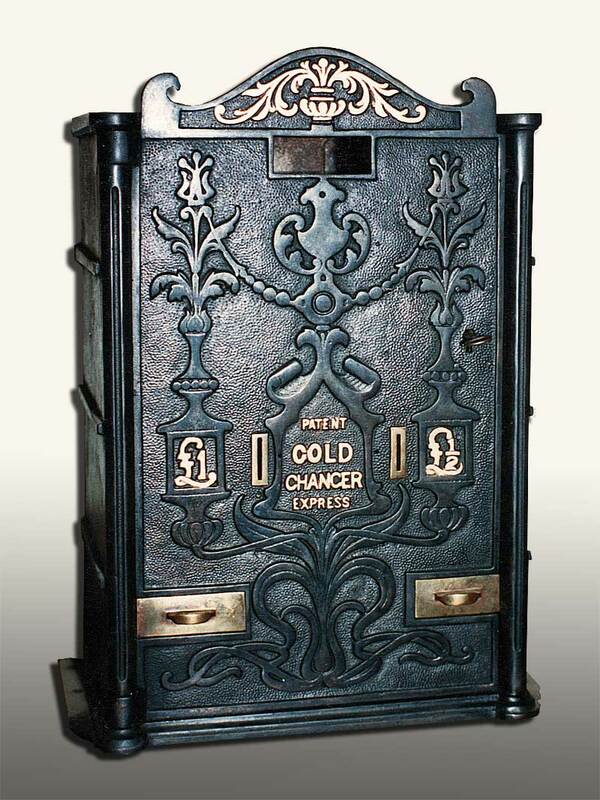 Designed to deliver a product, such as chocolate or stamps, in exchange for coins, there was supposed to be no element of chance. However, mechanical frailties often left honest customers short-changed, while the dishonest could get something for nothing. They only became truly reliable towards the end of the 20th century, with microchips monitoring their input and output. Their mundane function was sometimes offset by elaborate exteriors in a form of sculptural advertising. Two of these Fry’s cast iron chocolate vendors have turned up in Tasmania, which is where Cadbury and Fry’s chocolate factory was located in Australia. One of these is on public display at Cataract Gorge in Launceston, Australia but none are known in the UK. 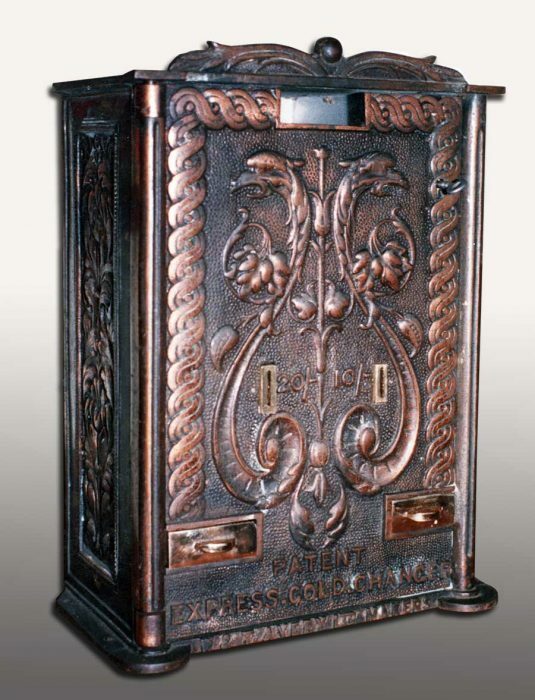 The mechanism is similar to other BAC cast iron chocolate vending machines of the period. 'The Supreme Automatic'. INSTRUCTIONS: INSERT COIN. WAIT UNTIL IT DROPS THEN PULL KNOB TO FULL EXTENT. 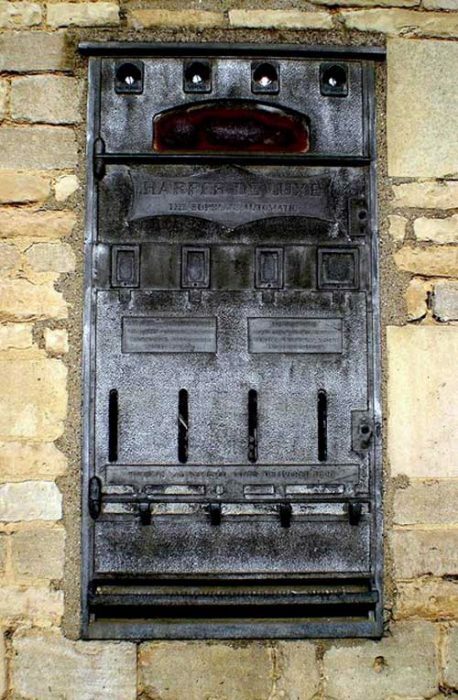 This early exterior wall-mounted cigarette vendor from the Harper Automatic Machine Manufacturing Co. is located at St Martin's High Street, Stamford. This four column steel-cased cigarette vendor was way ahead of its time with its amazing mechanically scrolling advertising banner which seems to anticipate the digital age. 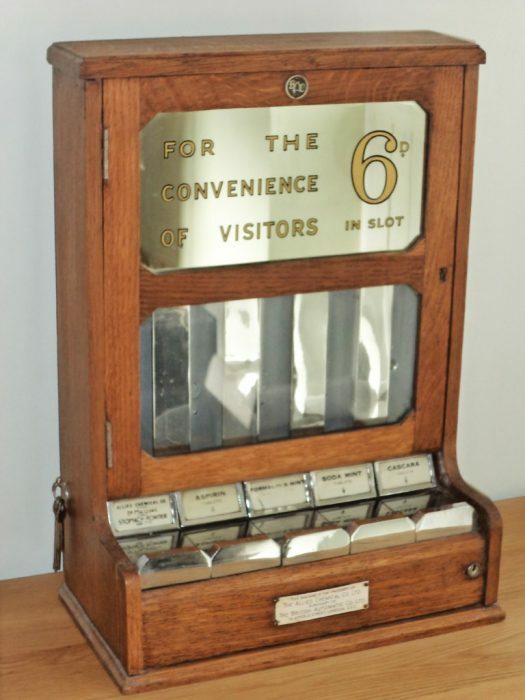 The 'ENTIRELY AUTOMATIC' product delivery mechanism was also advanced for its day, totally eliminating the need to pull or push a drawer to receive the goods, and thereby removing a common cause of trouble. A further feature of the De Luxe model was the central dial barometer in place of the Smiths clock. Painted tin wall-mounted single column cigarette vendor. 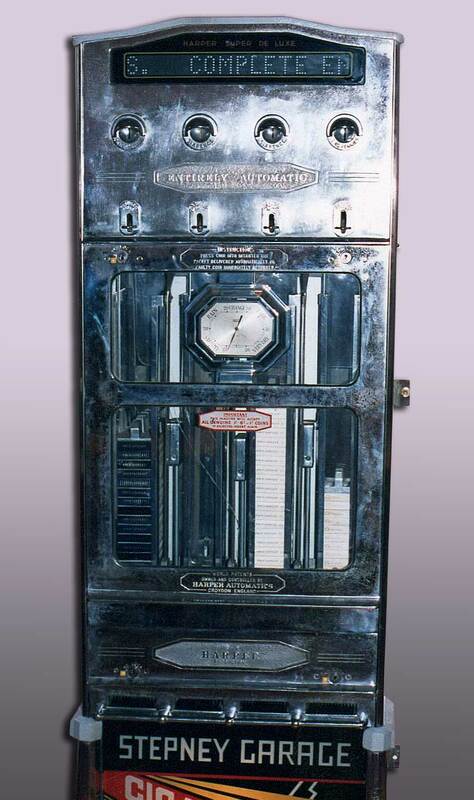 Like the BAC's large, metal, floor-standing 'platform' machines, this unit was rented to the shop/operator and remained the property of the Allied Chemical Co. Ltd. who were a subsidiary of BAC. This cast iron double chocolate vendor was a common site on major railway stations in the pre-war period.